Burnaby Food First | Food Security Through Community Action and Support: Volunteer Sales Coordinator Needed! The Apron Project is celebrating its third birthday. The community has responded well to our hand made aprons. We continue to get more sewing volunteers who are infinitely creative with the endless amount of fabric that is available. 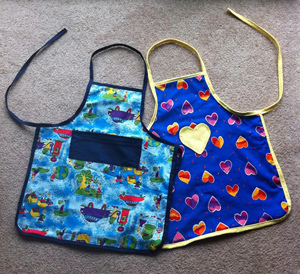 Cute children's aprons hand-made by a Burnaby Food First Apron Project Volunteer! Where are the aprons sold? and various other community events. 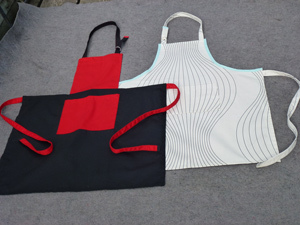 We would like to find someone to coordinate the sales of the aprons. Our busiest time of the year is the summer. The Volunteer Sales Manager need not attend the events. The main responsibility is to schedule volunteers and to coordinate the transportation of the aprons to and from the events. The Volunteer Sales manager does not need to have a vehicle but does need to schedule volunteers who are willing to provide the transportation. Other suggestions for sales ideas and venues would also be appreciated. Support for the position of Volunteer Sales Coordinator will be provided by The Apron Project Volunteers. For more information or to be our new Volunteer Sales Coordinator, email Leona! Sales of our aprons goes to support our cooking and gardening workshops and events, which helps to make sure that everyone has enough food to eat - food that is healthy, enjoyable and safe for us and the planet! Check out all the great ways you can get involved. All are welcome, and we'd love to have you on board! Stay tuned for any upcoming events and workshops! Burnaby Food First is a non-profit community based initiative. All donations will directly support food security projects in Burnaby. To find out about other opportunities, visit our Get Involved page. Click to send us email, with "Subscribe" in the subject line. Design by Christina Mak. Powered by Blogger.